Comic-Con Guide: Are you eligible for Conan tickets? Are you eligible for Conan tickets? In the last few years, Conan O'Brien has become one of the biggest gets of San Diego Comic-Con. It's not just the amazing guests (X-Men, Game of Thrones, Suicide Squad, Silicon Valley and others) or the chance to dance onstage like a fool on TV. It's not even the Conan Funko Pops, which have become such a coveted item that my AC repair guy was struck dumb when he spotted one in my house. It's also one of the more fun things to do at the Con with your friends. But you have to be prepared! Getting tickets is tough. Here's a primer if you've never been and some tips that might help even if you have. 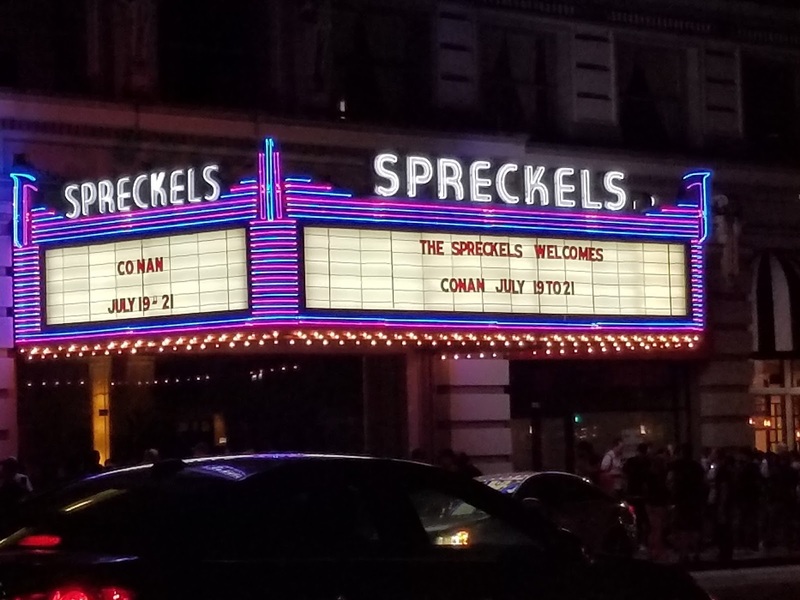 Conan tapes several shows in San Diego during the Con. Once you have tickets, you can tell your mom to watch Conan on the appropriate night which lets her brag to her friends that you were on TV, which might help her see all your SDCC tomfoolery in a new light. During the taping, shirts will be thrown into the audience, you'll be encouraged to holler and cheer till your throat is hoarse, sparkling celebrities will take a seat on stage, and then it will all end. On your way out you'll be handed a Funko Pop. Desperate collectors and flippers will sidle up to you and creepily whisper bids in your ear for those Pops. You'll either sell yours off and regret it later or wisely hang onto it. The timing: usually you need to line up super early in the morning (I arrived at 6:30 am one year and got a nosebleed seat) to get your wristband. You'll still be able to hit the Con when the Exhibit Hall doors open or shortly thereafter. Then you'll return to the venue that afternoon and be let into the theatre. The whole shebang is over by 5:30 or so. That said - this is a consuming affair. Getting in line that morning means skipping some other Con line and its panel/event. Having to go back in mid-afternoon trims another 3-4 hours off your day. In a world where every day presents Sophie's Choice in terms of choosing between Hall H, offsites, tournaments and other options, you need to be aware that ConanCon will control most of one day for you. It's not easy. But this is one event that prioritizes SDCC attendees, which is nice. Check that your Member ID account is set up to receive third-party emails. Create a 1iota profile if you don't have one already. They have an app which you should definitely use. ETA: I should have made this more clear - you need to get tickets through 1iota. It's not just about learning when tickets go live; you need to be logged into your 1iota account to apply for them. You can't just click a link and apply as an outsider. Make your profile fun. Post cosplay and Con photos. They want the taping to feature an electric audience in wild costumes so the viewers at home can say, "Oh, those crazy Comic-Con people!" Make a visual promise that you are colorful enough to fit the bill. You won't get much notice for when the tickets go live. If your job situation won't let you keep a digital vigil, find a Con friend who can use your info to apply for tickets. We've also been emailed special promo codes in the past, so make sure you have access to that as well. In the past, we've been able to apply for tickets (up to 4) for all shows. Consider yourself lucky if you get tickets to even one taping. 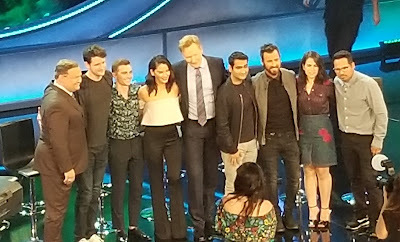 Despite everything I said above, people do bail on Conan tapings. SDCC is really tiring and sometimes they just don't have the energy for another event. Other times the Con programming for the day of their ticket sounds more appealing. So don't be afraid to ask around. People will have spare tickets. You can also try standby. I feel like the first two years were better for this than last year. But it's worth trying if you're desperate - and you may not only get in, but get good seats, especially if you're in cosplay. Check your 1iota account and password. If you don't use it that often, you may not remember. Sign up for an account if you don't have one and pad yours if you do. Download their app for Apple or Google Play. I'll post more when I know more. Stay tuned! ETA: ConanCon is now on Instagram and they say it'll be the spot to hear about celebrity guests, ticket updates and other tantalizing news - follow them at instagram.com/conancon/. I take it you didn't have to stand in last year's standby line which was overnight like a hall h line? Conan is as out of control as everything else now. I'll pass, thanks. I realize last year had some bugaboos - the AC issue in the theatre (a facility issue), people with tickets not getting (a Conan issue) and a very long standby line (an attendee issue.) I'm sure they're trying to make things smoother this year. And the standby line will be long - but it's an individual decision as to whether camping for Conan is absurd or justified. I want people to know it's an option, though not a guarantee of admission. i did standby for friday's or saturday's taping last year. I got there around 8pm and got wristband ~20. they didn't give out ANY standby tickets. the line was insane (stretched at least 4 blocks) and i heard people that won the lottery and were in line by 8am got turned away due to demand. i wasted too much time on this and won't do it again unless i win tickets. Some people with tickets did get turned away - and I believe some people got emails telling them not to show up. I'm hoping that's fixed this year. If the standby line is that bad, they should abolish it altogether and work from the wait list.